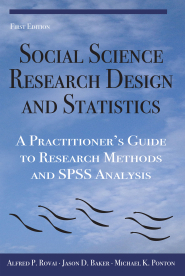 Watertree Press is pleased to announce our latest release entitled Social Science Research Design and Statistics: A Practitioner's Guide to Research Methods and SPSS Analysis by Alfred P. Rovai, Ph.D., Jason D. Baker, Ph.D., and Michael K. Ponton, Ed.D.. This is the first Watertree Press book being released not only in paperback but three electronic book formats: Apple iBook, Amazon Kindle, and Barnes & Noble Nook. This book integrates social science research methods and the descriptions of 46 univariate, bivariate, and multivariate tests to include a description of the purpose, assumptions, example research question and hypothesis, SPSS procedure, and interpretation of SPSS output for each test. Included throughout the book are various sidebars highlighting key points, images and SPSS screenshots to assist understanding the material presented, self-test reviews at the end of each chapter, a decision tree to facilitate identification of the proper statistical test, examples of SPSS output with accompanying analysis and interpretations, links to relevant web sites, and a comprehensive glossary. Underpinning all these features is a concise, easy to understand explanation of the material. Unlike most research and statistics textbooks, Social Science Research Design and Statistics combines research methods, statistical procedures, and SPSS procedures and screenshots. Additionally, this 556-page book is attractively priced at $29.95 for the paperback version and only $9.99 for the iBook, Kindle, and Nook eBook versions. "Social Science Research Design and Statistics is a well sequenced, well organized introduction to the world of social science research design and statistics. It is a unique gift to students, teachers, researchers, and consultants. This book will be an excellent first choice for any individual wanting to start the journey into the realm of statistics but also a great second choice for the many students out there who have found the journey intimidating. The book is generic enough to be most useful and user-friendly in a variety of disciplines. The authors’ approach to explaining concepts is far superior to the multitude of textbooks that have appeared on the market." Fred, a native of San Jose, California, received a BA degree (mathematics) from San Jose State University, an MA degree (public administration) from the University of Northern Colorado, and an MS degree (education) and PhD degree (academic leadership) from Old Dominion University. He also completed postgraduate work in systems management at the University of Southern California and possesses a postgraduate professional license in mathematics from the Commonwealth of Virginia. Following his retirement from the U.S. Army he served as a faculty member at Old Dominion University and then at Regent University and retired in December 2011 as Associate Vice President for Academic Affairs, Regent University. During his career in academe he authored or co-authored three books and more than 50 articles in scholarly journals and served on four editorial review boards. He presently writes, consults, and serves as an adjunct professor teaching research and statistics courses online. Jason is a professor of education at Regent University where he serves as the distance education advisor in a blended EdD program. He earned his BS degree in electrical engineering from Bucknell University, MA degree in education from The George Washington University, and PhD in communication from Regent University. Jason has authored or edited Internet-related books, numerous publications and presentations related to online learning, and currently serves on four editorial review boards for academic journals interested in education and technology. Additionally, he has consulted with various organizations regarding the effective use of educational technology and the development and management of online learning programs. Prior to joining the Regent University faculty, he served as an educational consultant and senior systems engineer at Loyola College in Maryland and associate engineer (communications) at IBM Federal Systems Company. Michael holds an EdD degree in higher education administration and a MS degree in engineering, both from The George Washington University, and a BS degree in physics from Old Dominion University. He presently serves as professor of education at Regent University, teaching primarily research related courses in EdD and PhD programs. He has published extensively in the field of self-directed learning, where his research interests include adult learning, personal initiative, autonomous learning, and social cognitive theory. He serves on the editorial boards for the International Journal of Self-Directed Learning and New Horizons in Adult Education and Human Resource Development. Before coming to Regent University, he was associate professor of higher education at the University of Mississippi. Prior to entering academe full-time, he was an aerospace engineer for the National Aeronautics and Space Administration at the Langley Research Center.